colonial village, where we stopped for fuel and coffee. A major pastoral and tourist centre located in Tasmania’s northern midlands, Campbell Town was established in 1821 by Governor Lachlan Macquarie and named for his wife, Elizabeth Campbell. The town has many fine examples of colonial architecture, including The Red Bridge over the Elizabeth River. 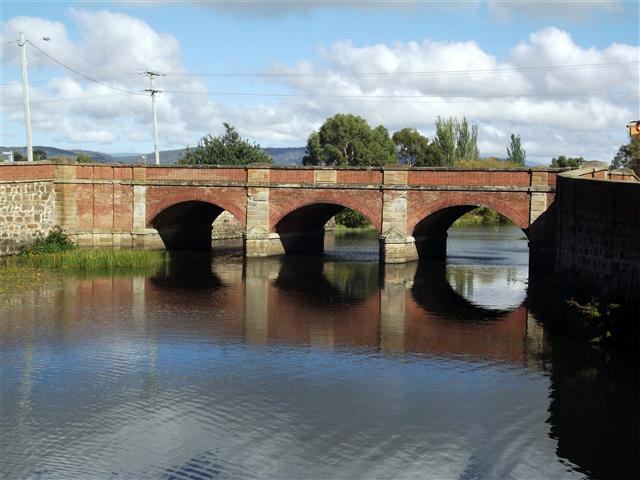 Built by convicts in 1838 and constructed of hand-made bricks, it is the oldest surviving brick arch bridge in Australia. In the park beside the bridge are some amazing sculptures that are carved from the remains of massive tree trunks and depict the history of the village and right beside the park and bridge is an historic colonial building dating back to 1836, the Red Bridge Café and Providore. But what an amazing little place Campbell Town is! It’s just like stepping into a time machine and it was a shame that we didn’t have more time to explore here. On our way out of town we passed the St Luke’s Church of England Heritage Church. A stunning example of colonial architecture, it was completed in 1839 and at the front is a memorial to Campbell Town’s only Great War hero, Private James William Victor Bush, killed in action in France in 1918.
with the location of some attractions we returned to the cabin for our bottle of Two Tails Sparkling Wine to celebrate another first night. There’s a lovely little garden area in the park and we took our bottle and enjoyed a quiet half hour before the sun went down and the temperature started to drop. 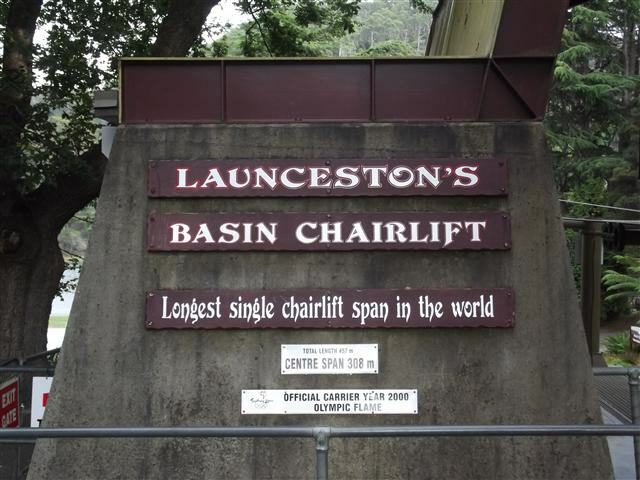 Our first excursion in Launceston was to the north to the town of Beaconsfield, some 40 kilometres (25 miles) north of Launceston. 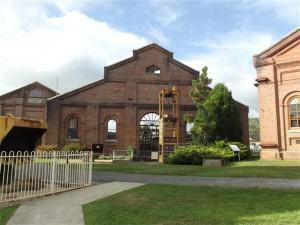 The area was first explored in 1804 and a settlement was established in the 1850’s. Gold was discovered in 1869. Beaconsfield was the scene of a mine collapse in 2006 where one man died and two others were trapped underground for nearly two weeks. The mine disaster received international coverage and the fact that the two trapped miners got out alive speaks volumes for their courage and the tenacity of the rescue team. We wandered around the Heritage Centre but were too late for the early tour and we decided not to wait around for the next tour. I don’t know if the tours actually go into the mine but if they do, it’s not something I care to do. Beauty Point was our next stop. Almost at the mouth of the Tamar River, the tiny township was the first deep water port on the river. A major fishing town, the Australian Maritime College has a campus here and two training vessels moored here as well. It was time for coffee and we stopped at Carbone’s Café before going on to Seahorse World, Beauty Point’s newest tourist attraction. This is a unique facility designed to conserve and protect this delicate and mystical creature. The tour was amazing and very informative. We learned about the breeding program, saw baby seahorses barely a centimetre in length, and were privileged to witness an egg transfer between a male and female seahorse. Our guide, Tegan, told us that it is extremely rare for this to happen in light as it usually only occurs in the dark. 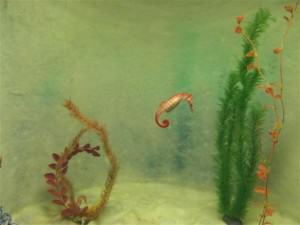 We also learned that seahorses are the only creatures where the male is the pregnant one and actually gives birth. There is also the Wonders of the Southern Ocean aquarium featuring all manner of sea creatures that have been caught right there in the Tamar River, as well as crabs, jellyfish, and the weedy seadragon seahorses. We were there for almost 1½ hours and thoroughly enjoyed ourselves. We left after the tour and made a brief stop at the Australian Maritime College before we returned to Beaconsfield for lunch at the Exchange Hotel. The hotel first traded in 1881 and very little has changed since then. The current owners are the descendants of the original owners. 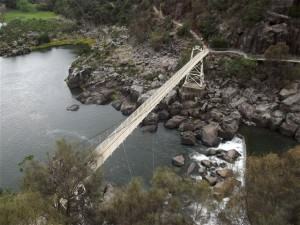 On our way back to Launceston we crossed the interesting Batman Bridge to the east side of the Tamar River. 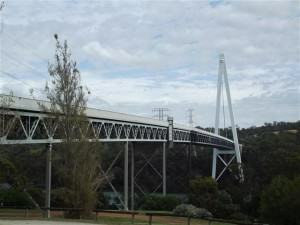 Completed in 1968, it was the first cable-stayed bridge in Australia and among the first in the world. It was named after John Batman, a grazier and the founder of the settlement that became Melbourne. 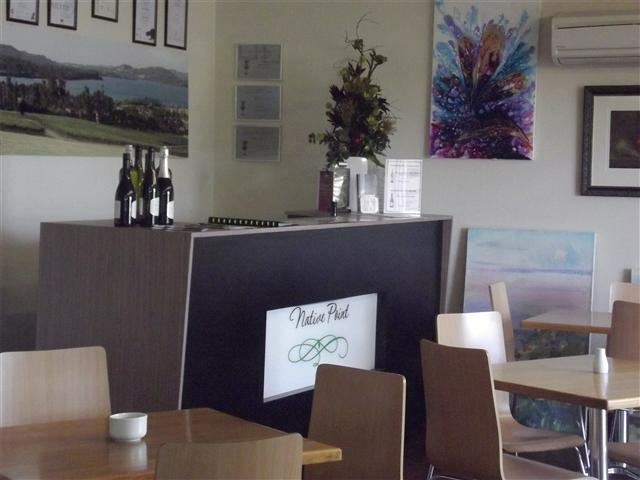 He was also the man who captured notorious bushranger Matthew Brady in north-eastern Tasmania in 1826.
reluctantly bid farewell to Native Point Wines and had our time here not been limited I would have happily come back another day. about its depth. There have been many myths and stories told about this including that it is bottomless and another one that a sub-marine sent in during the 1960’s failed to reach the bottom. In fact, in 2011 measure-ments were taken showing that the maxi-mum depth is actually 19 metres (62 feet). 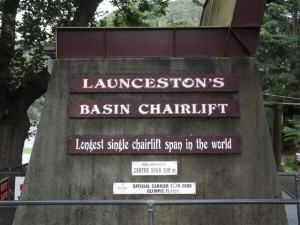 I found the history interesting but the Gorge beckoned and we waited our turn at the chairlift. Well, the Gorge is beautiful, no, it’s outstandingly beautiful! And absolutely magnificent. From the chairlift we had a wonderful view over the area and the ride itself was very smooth. We alighted on the other side and set off to walk around this stunning piece of our country. 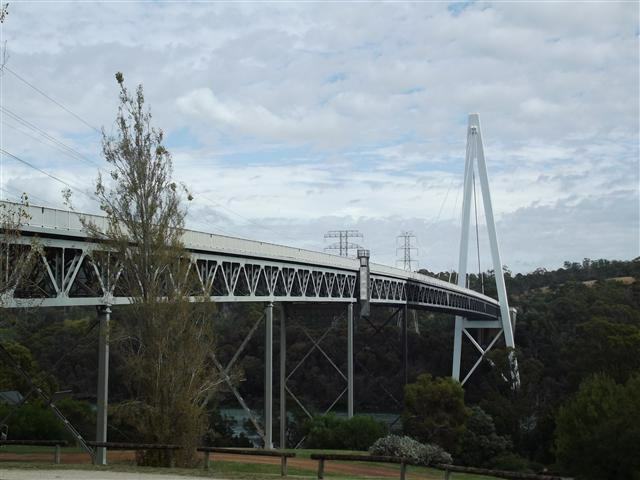 We wandered down to the Alexandra Suspension Bridge and I felt a few drops of rain but it was only light and gone quickly so I didn’t give it a second thought. The bridge, completed in 1904, is fantastic although when you reach the centre it sways a little and that was a bit scary. The Alexandra Lookout overlooks the bridge and much of the Gorge and it looked like a great place for photographs. We made the trek up to the lookout (after Wineglass Bay I never thought I’d do that again!) and this climb was much shorter than Wineglass Bay but a lot steeper. But what a view! It was amazing. And a few more drops of rain fell. 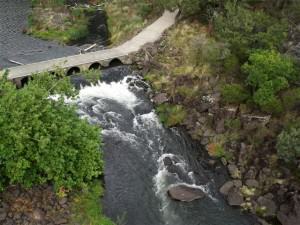 We didn’t stay at the lookout for long and later we walked across to the Cataract Walk and wandered down to Kings Bridge. The path was winding and narrow in parts but not bad. Built by volunteers in the 1890’s, it runs along the north bank of the Gorge. But the light sprinkles of rain were becoming more frequent and by the time we’d walked to the end and back it had become a heavy shower. We sheltered in the Rotunda and when the rain eased off made our way up to the chairlift. The weather had certainly taken a turn for the worse and the rideback on the chairlift was accomplished in bucketing, freezing rain. The wind was not too strong but any breeze was enough to have us shivering in our wet state. I couldn’t wait for the ride to end this time and it was not a happy end to what had started out as such a lovely day. 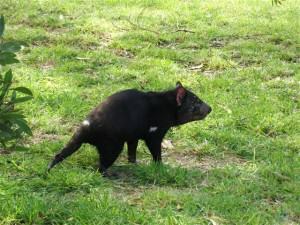 But there are other things to see and do here and one of them is Tasmania Zoo, known for its Tasmanian Devil breeding program. 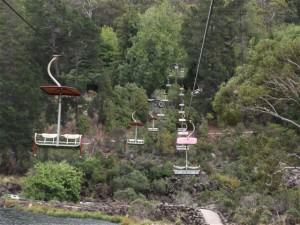 Located in the foothills of the Tamar Valley about 18 kilometres (11 miles) from Launceston city, it is the largest wildlife park in Tasmania. The Tasmania Zoo bus has a pick up and drop off service from most caravan parks in the area and we were set for a great day at the zoo. The zoo is privately owned and is home to more than 40 Devils. But it’s not only Devils there at the zoo, there are also exhibits of wombats, quolls, emus, koalas, and kangaroos, and over 80 different bird species. But I was only interested in the Devils. We left the zoo at lunch time and took the bus back to our cabin. 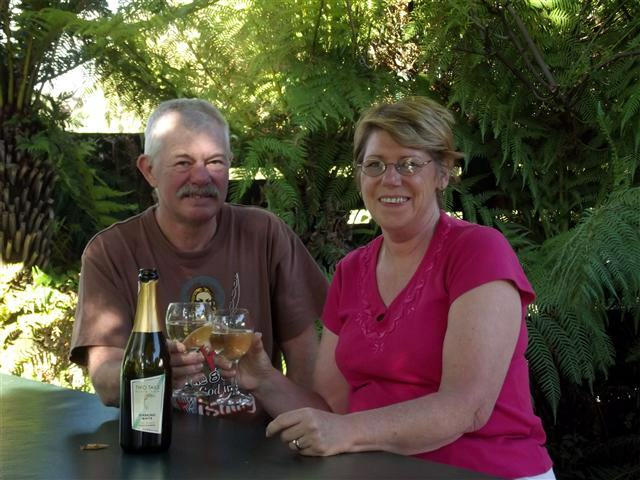 I had enjoyed our visit there and hope to do it again some time. For our last night in Launceston we felt that we had to do something special and later that evening wandered down to the Launceston Seaport for dinner. We found a little restaurant called Levee Food Co. right on the waterfront; it looked very inviting. Well, the meal was superb and very reasonably priced and we would thoroughly recommend it to anyone visiting Launceston. And what better way to end the evening than a walk around the marina. A strong breeze had come up and it soon became quite cold there on the waterfront. It was time to leave but I was definitely dragging my heels because I knew that our time in Launceston had come to an end – at least for now.